The sacral thrust test is a pain provocation test used to diagnose sacroiliac dysfunction. One single positive test does not have high diagnostic accuracy but a combination with other sacroiliac pain provocation tests gives valid evidence for sacroiliac dysfunction. Laslett et al (2005) state that no further examination is wishful if both distraction and thigh trust test provoke familiar pain. If only one test or 2 other tests are positive, further testing is required to obtain a valid result. Values for diagnostic utility can be found here. The sacral thrust test has a moderate intertester reliability of 74 (kappa=0,52 and p<0,001), sensitivity of 63% and specificity of 75%. Positive predictive value is 56% and negative predictive value is 80%. MT Cibulka, R Koldehoff. 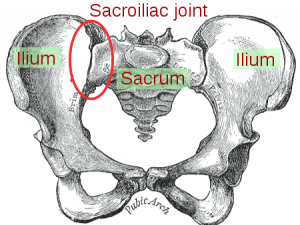 Clinical usefulness of a cluster of sacroiliac joint tests in patients with and without low back pain. J Orthop Sports Phys Ther. 1999; 29(2):83-89. P Dreyfuss, M Michaelsen, K Pauza, J McLarty, N Bogduk. The value of medical history and physical examination in diagnosing sacroiliac joint pain. Spine. 1996; 21(22):2594-2602.